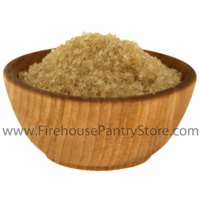 This raw cane sugar is an unrefined sugar made from the first crystallization of cane juice. Its large, coarse golden crystals and crunchy texture make it delicious in tea and coffee, sprinkled on top of baked goods and cereals. Use equal amounts (by weight) in place of white sugar in recipes. If you like Sugar In The Raw, you'll love this! Volume: 1 pound = approx. 2.19 cups. Ingredients: raw cane demerara sugar. Packaged in a facility that also packages wheat, milk, soy, egg, peanuts, and tree nuts. We use this in our Roasted Garlic Onion & Pepper Dip Mix, Chocolate Chip Cookie Dough Dip Mix, Mike's BBQ Rub, and No Salt! Grilling Seasoning.